Who’d be able to dream of talking, anthropomorphic creatures along with some bloody big headed queen who controls their world? Lois Griffin probably would. She did at one point have a dream where she tried drowning Stewie, so why not a dream of some world with trippy color? Lois – in my opinion – would probably be dressed quite sexier than Alice in her dream, and what of her other family members? What would they contribute to the storyline? Peter probably would be the March Hare or the Hatter – both being absolutely crazy and having no control of the zany things they do. Chris would be (with use of CGI) the Tweedle Twins, both very dimwitted. And her son, her youngest son? Yep, the Bloody Big Head Red Queen. 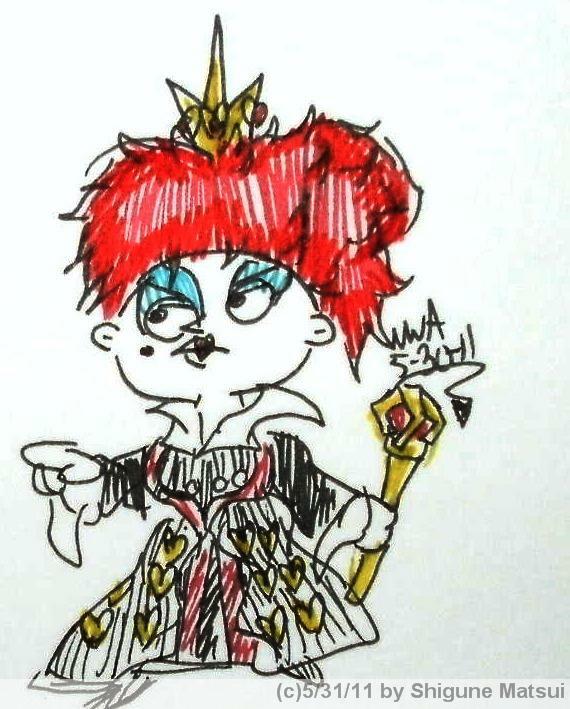 I figured that since Stewie likes to cross dress, was royalty in his past life also, and in specials such as the parodied renditions of Family Guy’s Star Wars was a villain, I made him the Red Queen. I did this concept since 2010 for the same reason, however I wanted to elaborate more on it. He still keeps the heart lips that Red Queen does, the heart hairstyle, but the dress is a little different. He keeps Meg as his warm, fat pot bellied pig like in 2010 movie. Meg doesn’t get much glory in the series, and any glory is pried away by the Jaws of Humiliation. She may have smashing good looks at age 40, but can she defeat the Bloody Football Head and “her” forces? DeviantART is a sort of claymore…. I’ve been though DeviantART, looking at pictures and sketch dumps in order to inspire me, should creative block come to feast on my mind. It’s a creativity paradise: digital art that is spotlighted every week, traditional artists (me being one) with pretty good sketch dumps in pen and ink, and many more. However, DeviantART does have its double edged sword properties. There have been people who trace and get over 1,000,000 pageviews, people who get pageviews by usings “bots”, and people who don’t use much creativity when they know they have enough to do a picture, etc. I’ve come across users who make OCs, original characters by making actual, established characters, then changing their hairstyle and clothes with the paint brush function, usually in MS Paint. Ever seen a black haired Sonic the Hedgehog or a Blue Sandy Cheeks? So that’s why I left. And I’m not posting anymore sketch dumps. They’re all going here. Adventure Time! sketches drawn by me. Yes, I enjoy sketching out cartoons and anime and also video games. If you want a request, just tell me in the comment box below and I’ll get to you right away. Sharpie Uncapped The site to submit Sharpie art! Kingdom Hearts Insider Site of Kingdom hearts news! My Twitter Account My tweets and musings are here. creation's dream My main blogger blog: creativity would’ve wanted this. Deadly Butterfly Betrayal The site of Riikainfinity, a great artist! Frederator Blogs! A blog of some of my favorite shows! Pancake pancake pancake Natasha Allegri’s blog, the series designer of Adventure Time. Write or Die Write within the time limit or pay dearly – make your choice…. Let Your Mouse Do The Walking….